Above: Section M showing Blocks A–W. * Most markers in place as of 2016 are visible in this image. 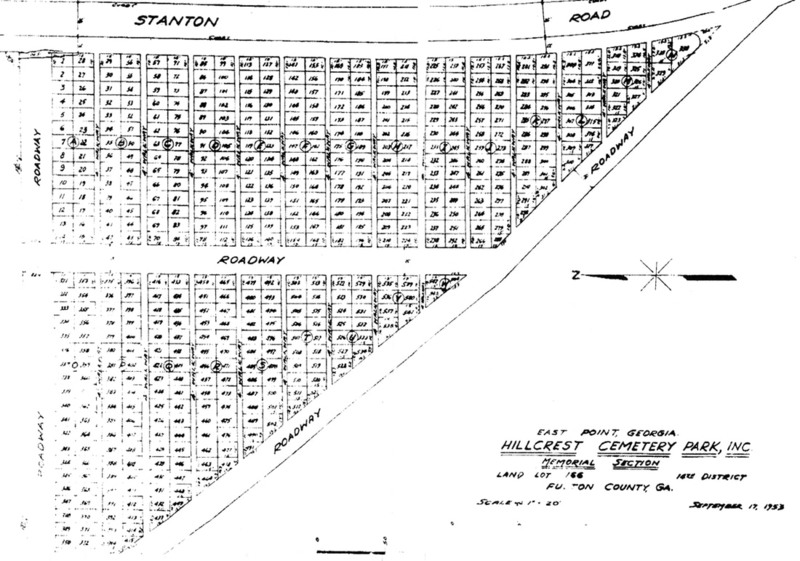 Section M is the part of Hillcrest located across Stanton Road from the rest of the cemetery. It is divided into 23 blocks labeled A–W. Unlike most sections, lots are numbered continuously throughout the section rather than restarting at 1 in each block. As a result, blocks are minimally useful references, and some documents simply list "Section M, Lot___." Lots are numbered 1–544. Blocks A and B are numbered in a back-and-forth manner, but oddly, the rest restart numbering at the top (east) end of the blocks. **Original plat maps accidentally repeated lot 433 in the back and front of block Q. Lot and space location in this section has always been a bit difficult due to the lack of marked graves. In April 2017, we went through the section and noted the surnames on every marker. This information was used to create the above map, with lines aligned to match lot locations pretty well. 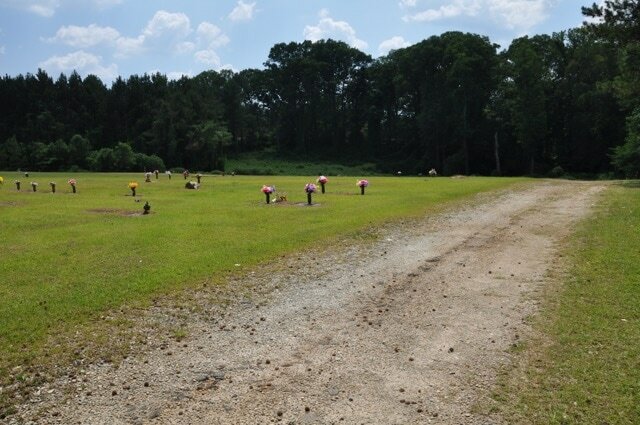 A few lots seem misaligned slightly so that headstones in one lot appear at the foot of the next lot. When searching on-site, just keep in mind that nearly all markers here are headstones, not footstones, so please keep this in mind. *Note: These maps should not be a sole source for locating placement of new graves. 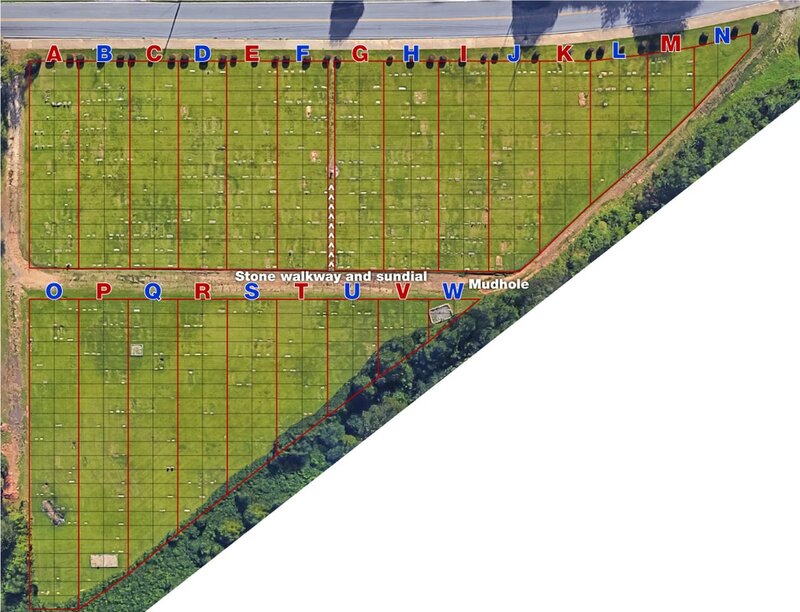 Aerial/satellite images are subject to skewing and the lines shown in the maps here are approximate for reasonably helping to locate a grave site. Technical measurements of spaces relative to known landmarks (marked graves) is highly recommended. In addition, this problem, combined with a lack of active management for the past couple decades, has created a few issues where burials have taken place in approximate locations, out of alignment with the grid, and in the walkways. Visual alignment with parallel marked spaces where locations and names can be matched are the best way to mark new sites. Note: All names from markers listed below are in closest proximity to the driveway that cuts through the middle of Section M (except as noted). 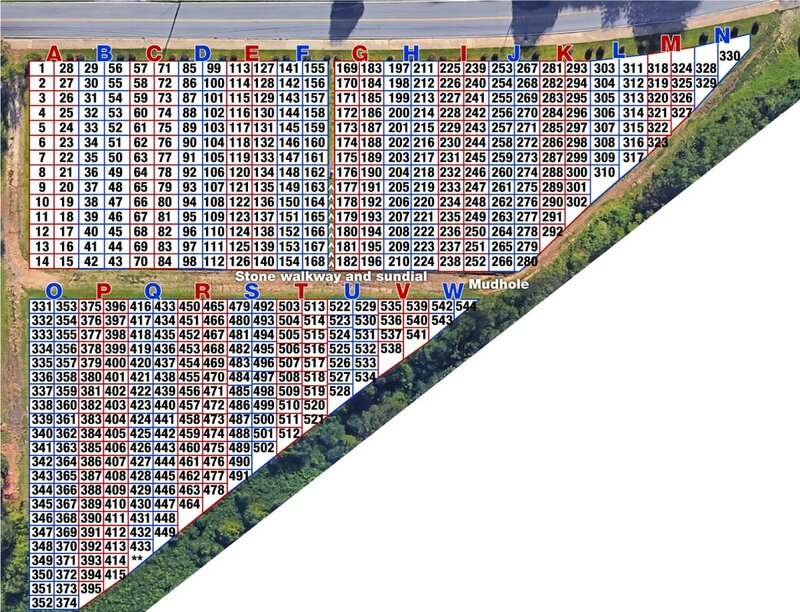 That is to say, if you walk down that driveway between Blocks A–N and Blocks O–W, the names in each block are the ones closest of most visible to you from that point. Block A: Popham in 13 and14. Adams in 16. Block B: Reese in 42. Pollard in 43. Block D: Camp in 98 and 112. Block F: Brown in 153. Spraggins and Tyler in 167. Block G: Puckett and Reed in 182. Cooper in 196. Block H: Campbell and Cooper in 210. Baker and Whitehead in 224. Block I: Hornsby in 238. Honea in 252. Block J: Robinson in 266. Dix and Weathers in 279. 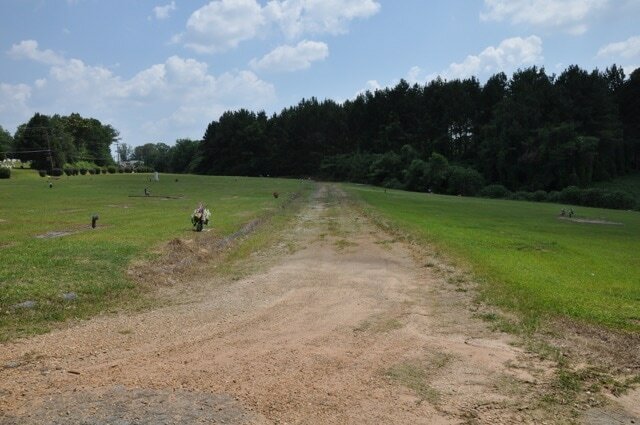 Block K: No graves near the driveway, but along Stanton Road, Garner is in 281, and Rosser and Stephens are in 293. Block L: Hendricks in 310. Robinson and Ellis are in 315. Block M: Henson in 319 (near Stanton Road). Kown in 326. Block N: No known burials. Block O: Waldrip in 332 and 354. L.M. and S.L. Shaw in 355. Block R: Stone and O'Kelly in 451. Foster in 465. Block S: Lariscy and Buchan in 479. Keith in 492. Block T: Redmond in 505 and 506 (4 rows back). Allen in 513. Block V: Williams, Fulton and Conner in 536. Block W: McCullers in 543 (border, gravel and angel). Photo taken at north entrance (left side of maps), looking west into Section M. Block A is on the left. Photo taken at intersection of the north entrance drive (left side of maps) and the drive through the middle of the section, looking south. Block A is on the left and Block O is on the right.